CounterStrike in the land down under had suddenly picked up the pace with Oceania Qualifier for both the IEM Sydney 2019 and ESL Pro League Season 9 starting off together on the same day. Though it gave way to a lot of local CS action for the fans and enthusiasts I think there was a lot lost as well due to some teams being a part of both these qualifiers. To give you guys more clarity let me provide some more details about the two qualifiers. The Oceania Qualifier for IEM Sydney took place from 12th-14th April. The qualifier witnessed participation from 8 teams out of which 4 were direct invites while the other 4 made their way through the open qualifier. It came to an end yesterday with Grayhound Gaming making their way through to the Main Event after taking down ORDER in a best-of-five Grand Finals. The qualifier followed a double elimination format with every match-up being a best-of-three except for the Finals. It was a great qualifier with a number of upsets and a lot of quality CS. Out of the 8 teams participating in this qualifier, 3 teams were also a part of the ESL Pro League Season 9. Though it was mainly Paradox Gaming that faced problems, the other teams could manage their way around the packed schedule. Still, it is a massive inconvenience for the teams and also the viewers get split up instead of enjoying one event at a time. Australia already faces quite a lot of problems when it comes to esports, we can easily make sure that the overlapping of events and cramping the team's schedule is not one of them. The first half of Oceania Qualifier for ESL Pro League Season 9 also took place from 12th-14th April. 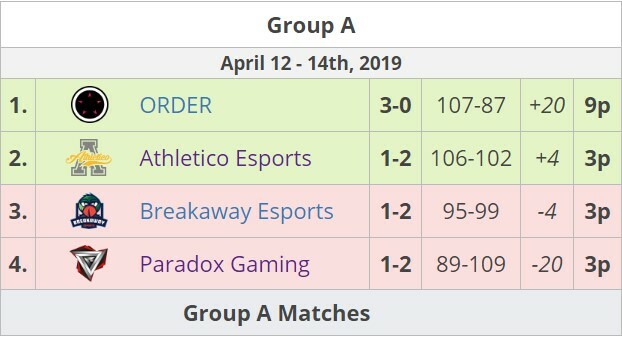 Out of the 4 teams who were part of Group - A, 3 were also a part of the IEM Sydney Qualifier which led to Paradox having to sacrifice their Upper Bracket Quarterfinal match in the other event. The other two teams could have also landed in a problem but somehow managed to steer clear of the conflict in the schedule between the two qualifiers. Hope this is looked into and does not occur again in future events. Stay tuned as IEM Sydney 2019 is right ‘round the corner.